Hours before UFC 234, it was announced that the main event was canceled due to UFC Middleweight Champion, Robert Whittaker, having to withdraw because of an emergency hernia repair surgery, leaving the challenger Kelvin Gastelum hanging. However, this didn’t only affect Gastelum, the co-main event, Israel Adesanya vs Anderson Silva, was said to be for the next middleweight title shot. 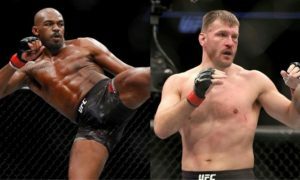 Obviously, this is no fault of Kelvin Gastelum, so he obviously deserves his shot at the title first, but there is no denying that Adesanya also has his case for a shot at the belt. Adesanya, better known as “The Last Stylebender,” has only been in the UFC for a year and has gone 5-0 since his UFC debut to move his professional record to 16-0. In his 16 professional fights, he has 13 finishes, six of which came in the first round. 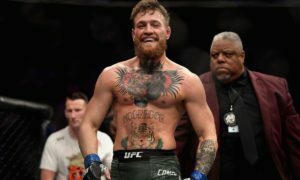 There is absolutely no denying this former kickboxer, turned MMA phenom, is making a serious name for himself in the UFC. 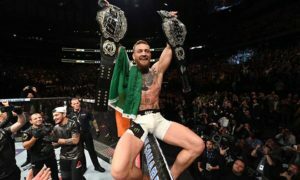 His most recent victory coming as a unanimous decision over the greatest middleweight fighter of all time, Anderson Silva. While Silva is 43 years old, he is still an absolute killer in the octagon and gave Stylebender a real test. 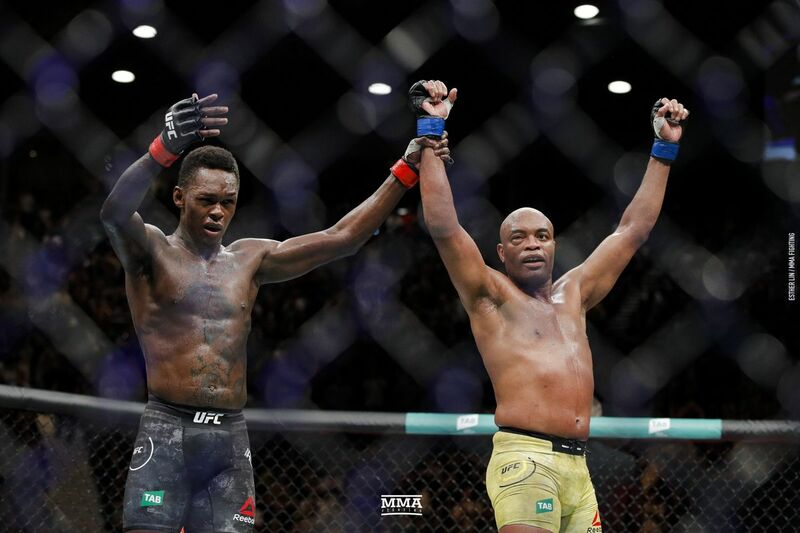 At several points in the fight, Silva even had Adesanya in danger, but ultimately Stylebender was able to come out on top by outstriking one of the most prolific strikers in MMA history. Currently, Adesanya has the second longest active win streak in the 185-pound division, with five straight wins. His streak is second to only the current champion, Robert Whittaker. 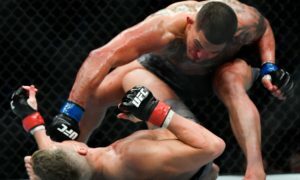 After Whittaker’s inability to compete, Kelvin Gastelum took the liberty of naming himself UFC Middleweight Champion and was even carrying around the 185-pound belt during the show in Australia this Saturday. Obviously, Whittaker never lost the championship, and as far as anyone knows, the UFC doesn’t have any plans to strip Whittaker of his belt, not yet at least. When a fighter goes out with injury, especially one as serious as a hernia repair that will likely take several months to come back from, it puts the UFC in a tough spot. The middleweight division is pretty competitive, especially at the top right now. From Gastelum and Adesanya to Luke Rocked and Yoel Romero, there are plenty of fighters waiting for their shot at the belt. So what will they decide to do? There are several different ways this could go down. One being they strip Whittaker off the title and Adesanya and Gastelum fight for the interim title in late spring/early summer, then when Whittaker is ready to return, he gets a shot at the undisputed title in the late summer/early fall. The other option is they could hold off until Whittaker comes back and in the meantime have Stylebender fight one of the other top five middleweights, then challenge the winner of Gastelum and Whittaker, whenever he should return. Right now, the whole situation is very messy and no matter what they choose to do, there will be people who aren’t going to be happy. 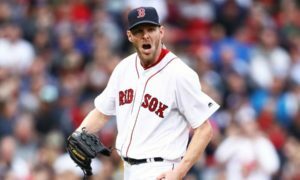 That’s just the way it goes when you’re dealing with a champion not being able to compete at no fault of their own. If they strip Whittaker, obviously his fans and team will be very upset, but if they don’t strip him it creates a logjam in the 185-pound division. We can probably expect a decision within the next few weeks on what the UFC will decide to do, in the meantime, all we can do is wait.